City State is a multi-disciplinary residency program in Indianapolis. Creatives from a range of backgrounds are invited to explore the character and complexity of Indianapolis through experimentation and provocation. In turn, City State inspires and challenges Indianapolis to think more creatively and rigorously about its past, present, and future. The hope is to stimulate the city's collective imagination towards designing a more just, resilient, and wildly generous creative citizenry. Oliver's design studio, Outside, was engaged to develop the creative strategy and identity of City State. 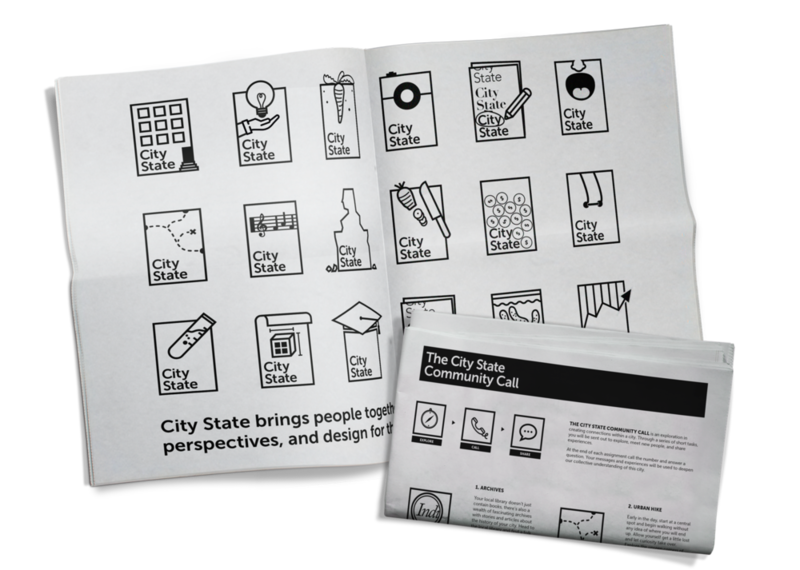 The outcome was two-fold: the City State Community Call newspaper and the City State logo-set. Created to reflect the immense diversity of creative disciplines that City State brings to Indianapolis, the identity flexes and adapts to fit each resident of the program. With the team at Outside, Oliver created the basic City State logo– an empty canvas –which was then remixed to create 25 different adaptations reflecting everything from farmers and fermenters to vocalists and economists. Complimenting the logo-set, the City State Community Call newspaper takes the traditional strategic mission statement and transforms it into a interactive city-wide civic engagement for Indianapolis. In the newspaper, alongside learning about City State, residents are invited to engage in a series of creative interventions that encourage civic exploration, discovery, and reflection.